This is one of my favorite poems by the ancient Greek poet Sappho. She was a master of packing a lot into a very tiny lyric — which is good since, tragically, only 200 scraps of her verse survive. This one is magnificent. In a mere eight lines, she paints the melancholy of middle age onto the canvas of the night sky. There’s something else about this poem, though: Its astronomical specificity! … this occurs before midnight. Recently, two scientists got interested in the poem, because they realized these two facts could be used to determine precisely what time of year Sappho wrote the poem. After all, constellations change their position in the sky as the year progresses. That means in different months they’ll sink beneath the horizon at different times of day. 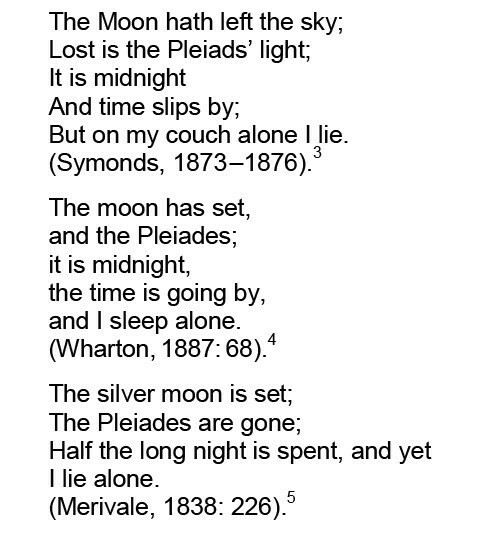 Since we know that Sappho saw the Pleiades go down before midnight, first you have deduce where Sappho was located — geographically — when she wrote the poem (because this will determine what part of the sky she was looking at). Then you check the star charts from that vantage point, and figure out what time of the year the Pleiades would have been visible right until midnight. That’s what the scientists did, in their fascinating paper “Seasonal Dating of Sappho’s ‘Midnight Poem’ Revisited”. You can read the paper here — it’s really fun — but the tl;dr is this: They started by working with the year 570 BCE, around the time that Sappho died. (This year is, they admit, fairly arbitrary; but a deviation of a few years wouldn’t change the position of the Pleaides noticeably.) They assumed that she wrote the poem in Mytilene, which was the capital city of the island of Lesbos, and where most scholars suspect Sappho lived at that point in her life. Then they used a bunch of software, including Starry Night, to visualize the night sky from precisely Sappho’s vantage point. They discovered that Sappho could have seen the Pleiades before midnight from the late winter until the early spring. Assuming that Sappho observed from Mytilene on the island of Lesbos, we determined that in 570 BC the Pleiades set before midnight from 25 January on, and were lost to the evening twilight completely by 6 April. Those are okay, but they lack the deft, bleak drama of Barnard’s version. Particularly her second stanza! 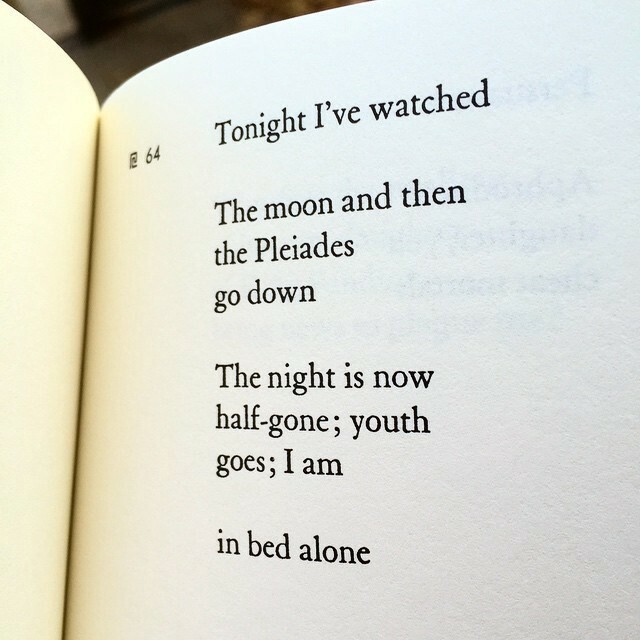 Night is “half-gone”, but youth goes; the former is a factual statement about this particular night, then the latter pulls the camera back about sixteen miles and boom, you behold the existential arc of a life. Then she leaves you with that little hang at the end of “I am” … and nails it to the wall with the final line.